Digital innovation has disrupted many a markets. The rate of change defined by mean time between changes has increased exponentially. The internet has brought goods, services and productivity of a global scale within reach of the world as we know it. The only limiting factors remain regulations and the ability to fulfill (in case of physical fulfillment cycles) orders placed. Examples of Amazon disrupting retail markets, Priceline and expedia disrupting traditional travel agencies, WhatsApp disrupting telecoms, Uber disrupting the taxi business and AirBnB disrupting the hotel reservations business abound. These business models are rapid in gestation and instantaneously disruptive at a global level. Digital technology remains the backbone of such disruptions supported by the ubiquitous spread of the internet. Can one argue that an Apple employee is 65 times more productive than a TCS employee or is this more an innovation premium yardstick? The ellipsis below show the valuation modulation across innovation types. Without getting into arguments of frothy and unsubstantiated valuations, we see someone willing to pay 8x of EBIDTA for traditional valuations, 28x of revenue for Digital platforms hosted in the cloud based valuations and 3 times Gross merchandise Value (GMV) for dominant eCommerce retail valuations. GMV is a new norm and is a super set of cost of goods sold since marketplace connection models do not even get the goods on an online retailers books – but are considered in valuation schematics. 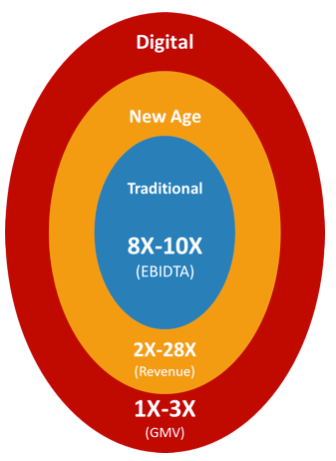 In short for a $10M EBITDA on a $100M revenue base, could value a tradition firm at $80M, a new age firm at $280M and a eCommerce firm with a GMV of $1B at $3B. We will discuss the new normal on return characteristics and the devaluation of the profit focus in the next segment.